Savina Cavallo: What is the Most Loving Thing To Do??? What is the Most Loving Thing To Do??? It's been very difficult for my brother and me to deal with our father's accelerated aging process. He just turned 95 years old and caring for him and being present for his needs as he becomes more dependent has been a real emotional, physical and even spiritual challenge. It's challenging to keep a loving attitude when he is he adamantly resists receiving our help. It's challenging when he's bitter and negative towards us because he doesn't accept his reality. It's challenging to stay centered and detached yet compassionate. I had expectations of taking care of my dad and even living with him through his last years and being there for him....it has not turned out that way at all. I've asked myself over and over, what is the most loving thing to do here? How do I remain emotionally balanced, and not be sucked into my dad's negativity and whining attitudes, yet provide him with my presence and support his needs? My brother and I have also had to deal with the added stress of judgmental extended family wanting to force us to manage the situation according to their standards. This has brought about unnecessary strain in our caring for our dad's needs. I am asking myself, what can I learn from this? How can I practice Love? First, love for myself, since this situation brings up feelings of guilt, shame, frustration, and even feeling like the victim....which I have felt at times. Then, love for my father. It's a constant asking myself.....what is the loving thing to do here for him? With time I've come to see that what he says and how he behaves are two very different things. So it's been a real trial and error practice to intuit what's really happening and what needs to done. Third, dealing with the extended, toxic family that my own father has invited into the situation and has created by putting them against my brother and myself. I have had to pray, journal, write love letters, to reach for answers within. There really is no manual to follow. Only from within have I been able to find the peace and inner knowing of what is the most loving thing to do for all involved. And this is day to day, moment to moment. 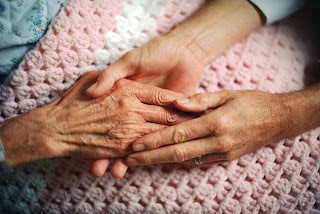 I know there are many out there caring for their elderly parents who deal with similar situations and feelings. It can be a blessed opportunity to practice self love, and love for another in a detached yet compassionate way. It is an opportunity for going within and finding what feels right in a truly difficult situation. I'm learning to practice balance, inner stability, and doing what the situation calls for not allowing my father or anyone else to manipulate me or the situation. I have actually come to a place of inner peace and self trust. I am doing the best I can in a very emotionally loaded situation. And that's a hell of an experience. Thank you for your lovely comment Roseann. Beautifully said, Savina. I love that you own your own feelings about this and that you have come to a place of inner strength and peace within. Well written Savina. A considered piece that reflects all the heartache you have gone through to get to this place. You are strong and you know what is right for you.